Trans communities across the world face extreme scrutiny and discrimination on a daily basis- within work places, schools, universities and even social settings. Unfortunately, these struggles are a result of ignorance, and a clear lack of education. Despite this, universities across the UK are continuously attempting to produce safe environments for trans students, informing staff of personal pronouns, and reporting any hateful behaviour towards this community. Therefore, the notion of gender should not be simplified. It is an intricate topic, not ‘black and white’, but rather one that can be interpreted by all of us in many different ways. Artefact spoke to trans students about their different creative outlets, and how their personal experiences shine through every piece of work that they produce. Art comes in virtually every form that you can think of- evoking an array of emotions, distinctive to every individual who prays their eyes on any piece of work. To some, art is the act of expressing emotion, creating beauty to be enjoyed by the lovers of all things decadent, or simply making a statement. Sometimes these statements may hold political, personal, or social, and perhaps occasionally comical meaning. Other times, a piece of art may contain all of the above. It may be to some a way of understanding their personal growth, their own life journey and coming to terms with the many obstacles we face in life. A coping method. Natalie Wearden studied BA Print and Time Based Media at Wimbledon College of Arts, graduating last year. 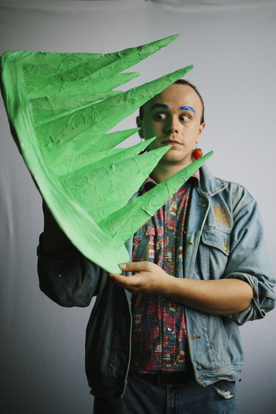 Wearden is a performance and visual artist based in London, ‘interested in queer intimacies and ways of being okay alone.’ They have performed all over London with ‘Selkie Skin’, ‘Queer Poems from Scotland’ and many more. 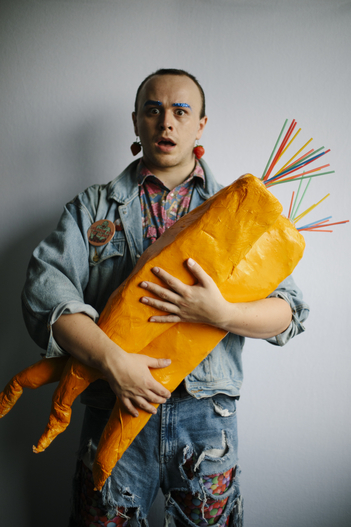 Wearden expressed that their art is a way of controlling a personal narrative, understanding personal growth and human experiences that are too often over-simplified and misunderstood, ‘as a queer person it is so important to be seen and visible in a way that you want to be understood’ they said. Wearden’s art is a way of coping with life’s experiences, be this the distant friendships within their life, the transitional period of graduation, or understanding gender and identity. Significantly, Wearden’s degree show ‘The Best Thing I Ever Made’ encapsulated the journey of their own identify and state of mind after a graduation. In a ‘ritual’ performance, Wearden printed onto tracing paper 3000 of their own Instagram photos, deleting them as each photo was eaten and the caption of the photo was read out. A cleansing of the soul, a way of removing the past and transitioning into a new being. Wearden believes that this show captured the personal feelings of graduating, letting go of the past, and using the physical body to create a blank space, ready to move onto the next period of life. ‘‘I wanted to make myself blank, I wanted to remove everything,’’ they said. By borrowing from Roman Catholic motifs, and re-owning a tradition they grew up with, Wearden used this right of passage to celebrate a new stage in their life. Reclaiming traditions, new and old. Wearden then washed of their makeup-a fresh new canvas is born. Later, their friend physically beat them during the show, which later turned into a ‘queer baptism’ with glitter being poured over Wearden’s head. Finally, the ritual ends with a party, as they explained often within transitional periods in life there is a big celebration, used to mark the end of a chapter and celebrate the new and the great unknown. Wearden’s work is visually captivating, with a strong sense of familiarity. A sense of wanting to reclaim memories, destroy an old self, and re-birth a new and perhaps not fully comprehensible version of yourself, a version that will take you through a new journey in life. Currently, Wearden is using their art as a way of coping with long-distant friendships, through the ‘feminist, queer and trans metaphors’ that emerge from folklore. The inspiration for this performance comes from Selkie stories, ‘‘Selkies are a mythical creature, a seal in the sea, that sheds its skin on land to become a human. The stories are heard traditionally in the Northern Isles, but also in the Nordic countries where I was based at the time,’’ they said. Wearden hoped to simply understand and represent the beauty of the stories, rather than re-telling and re-creating the already magical meaning behind these tales. The stories present many different themes and ideas about gender, feminism and personal identify, alongside our inner desires. These metaphors can resonate with many of our own personal lives also, the feeling of expressing different identities and fulfilling our hidden desires. The performance attempts to capture a life where we wish to seek our truest forms and escape into a world where these forms are accepted. ‘‘Through the tales, we are working towards a queer understanding of the ecologies of the north. 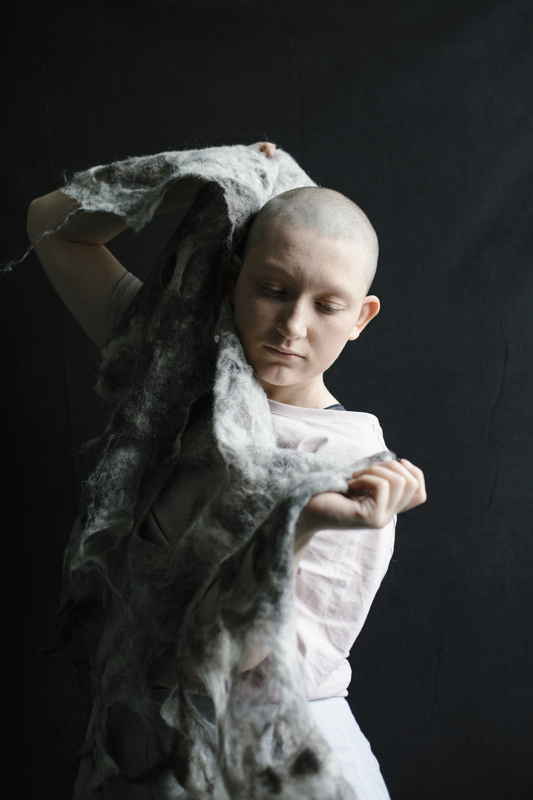 We work with wet felting – a technique also found in the Northern Isles and the Nordic Countries and have felted our own Selkie skins, and called across the sea, dreaming of ways to be together again. There’s also a lot of experimental writing we have developed together, I have used this in performances in Helsinki, Stockholm and London and Indigo is producing an intricate lino print with our text and illustrated Selkie imagery. Together we had an exhibition and performance at Syn Festival’s Odysseys Exhibition at Summer hall in Edinburgh in February’’ they tell Artefact. Wearden’s performances are a way of understanding the many different ways one can explore their identity, and coping with the pressures that are placed upon us by society. They are using their art to illustrate and promote a new understanding of weirdness, noting that there is always a familiarity within their work, linking this to gender, sexuality and their own identity alike. They use their work to encourage growth, through art that is inspired by science fiction and absurdism. These familiar things attempt to promote an understanding of our view of the unknown. There is always a familiar ‘home like’ element within the objects, concepts, theories and identities. By looking deeper, we accept and understand that these ‘different’ things are not so different at all. This degree show turned into something very personal, ‘‘It was my tutor who made me realise this, ultimately what I want is for my art to be endearing and for people to be slightly unnerved by the familiar, you know, they see something they recognise, the uncanny effect, and thrown by how strange different ‘other’ it is, and then surprised by the live element,’’ they said. Tom’s art is loud and colourful, often with humorous elements also. ‘‘Through art school I was really serious, now I’ve learned to value humour. I think humour is also such an important part of the queer scene, and it’s so important to gender. My expression of gender is very playful, its that playfulness that allows me to experiment with it, and it’s the same with art,’’ they said. Tom’s show ‘ART-O-RAMA’ created with Sophie Popper for Tate Exchange in 2017 tackles the financial challenges that face artists around the world. The show is a ‘comical’ way of understanding the hardship of artists while using a ‘colourful and camp’ set up. It is a game show; the wheel of fortune will decide how much money you have to create a project of your choice. Certainly, something creatives can often relate to. Tom’s art attempts to build connections, and stimulate an understanding of the experiences we all share in some way. 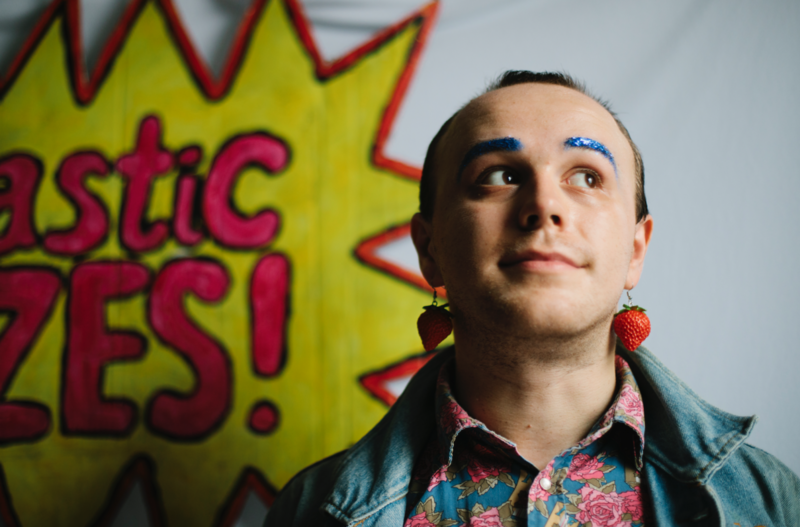 Tom’s art is a way of understanding their own identify also, while trying to illustrate the complexities that exist within gender and identify. Tom attempts to create an understanding of people through their art. If people looked at a familiar aspect within each other, and understood that human identify is far more complex than we wish to accept, it will create a more welcoming and understanding environment for every one. Rubie Green is studying Fine Art at Central St. Martins, and is currently working on music, song-writing, sculptures and writing. Rubie uses their work as a way of understanding their own personal experience of gender, which is ‘an on-going navigation’ for them. 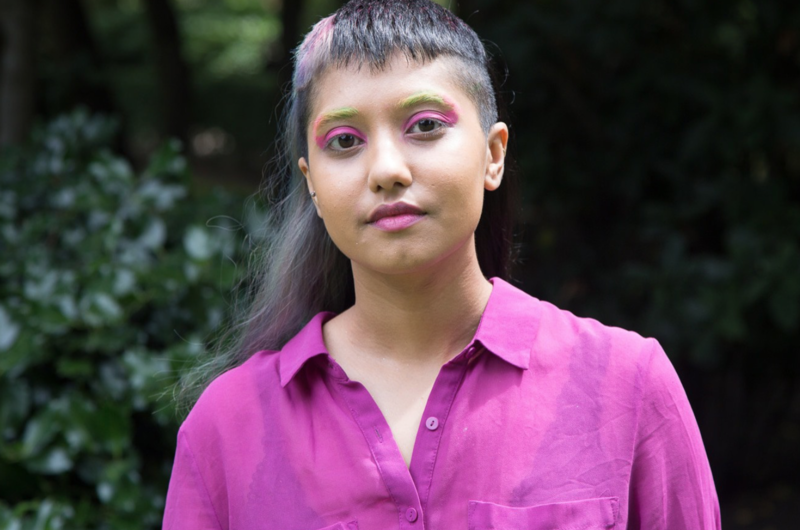 Using this work Rubie wants to change the way of thinking in regards to gender, ‘‘I am interested in disrupting binary thinking and resisting simplification of ideas, including pointing it out when it happens on the queer side of things. I think the trans/cis binary is just as important to question as the male/female binary,’’ they said. The work produced by students can reflect a personal timeline of understanding, the beginning stages suggesting a curiosity and attempt to understand initial feelings surrounding gender, while working through a journey that illustrates freeness and desires being understood. The process of creating art can be a journey to understanding our desires, and pushing the boundaries and restrictions that are too often placed upon us. ‘‘The work provides an outlet for me to set an example for how I want the world to be, a space where I’m more confident to say who I am and the journey I’m on when I’m often unable to in my daily life. It can feel cheap or unintellectual or whatever to make such directly personal work, but I really do think I have something important to share as someone who is unresolved and on a journey. I really hope other people who, like me, don’t always feel like they’re ‘enough’ can see what I do and feel able to be themselves. Whether that’s in terms of gender and queer stuff, or more broadly extracting ourselves from our limited, binary defaults, deprogramming ourselves,’’ they said. Rubie is currently playing gigs, ‘‘minimal jazz-wavy music with lots of theatrical songs about my sloppy in-between transition.’’ Creating such personal work can feel risky, as it is a reflection of our deepest truths, or perhaps the truths that we cannot understand completely, are attempting to understand, and illustrate to the world. An important message is being presented through these different personal journeys, and the work should be celebrated. The university attempts to make a safe environment for this art to come to life and the trans students to feel safe, respected and understood. Through this work, Katayoun aims to spread important information across the universities, making sure that students are aware of where to go if they need help or information, or if they simply need support. ‘‘I really believe the union needs to be a safe space we’re students can reach out when they are facing non-academic issues, and that’s what I’ve been aiming for in the past year,’’ they said. 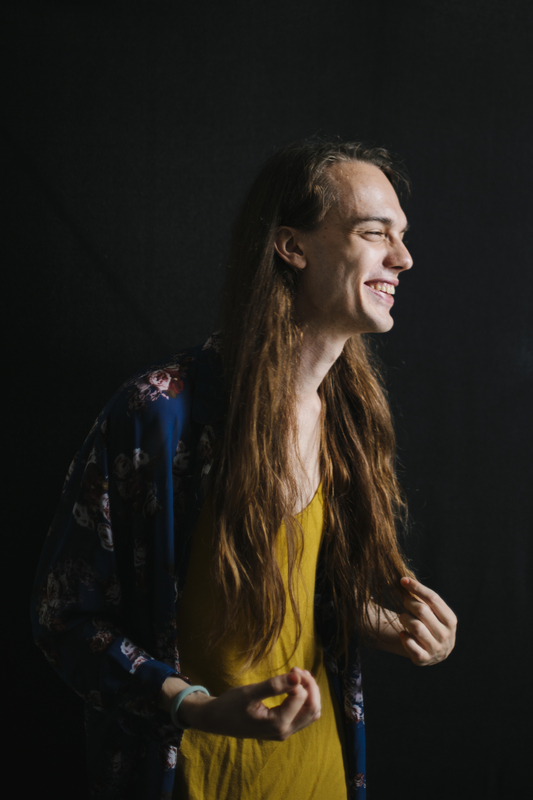 Katayoun specifically works closely with trans students also, hoping to raise awareness and representation within the university. Students can also look out for upcoming events, where support is provided for LGBTQ students. On July 6, Arts SU and the Bishopsgate Institution are doing a collaborative pride event at Bishopsgate in Liverpool St. The Event is free and open to all UAL students and the public, it is a day of art, archive tours and discussions around LGBTQ and pride. Everybody is welcome.